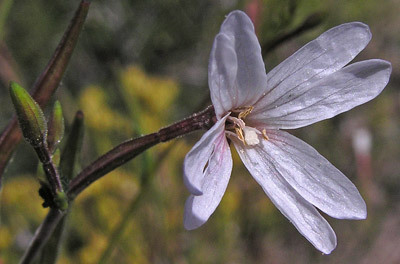 Epilobiums are often difficult to identify because there is, as Intermountain Flora states, "rampant hybridization in... Epilobium". 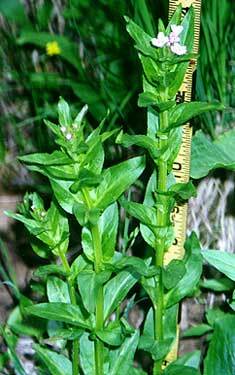 Intermountain Flora also indicates that in about half of the species in our area, "specific distinctions are... vague". The three species shown below are in this vague group and are highly variable in many of their growth characteristics. 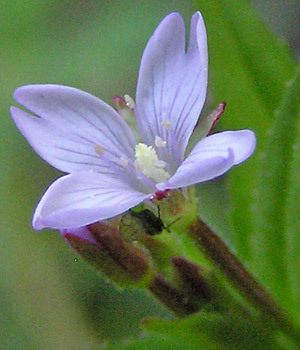 Linnaeus named this genus in 1753; the word "Epilobium" is from the Greek for "upon a capsule" and refers to the long tubular inferior ovary, shown extending to the left of the pinched area in the center of this photograph of Epilobium ciliatum. Montane, subalpine, alpine. Wet areas, tundra. Summer. Stony Pass above Silverton, July 21, 2012. Epilobium anagallidifolium grows from 1 to 9 inches tall, somewhat mat-forming, with a number of stems, these often curved to S-shaped. Leaves are sessile or short-petioled, ovate to oblanceolate, to a bit over an inch long. Some floras indicate that the leaf shape varies according to the position on the plant: basal = spatulate to oblong, mid-stem = elliptic, and above = lanceolate or nearly linear. Other floras simply indicate that the leaf shape varies. Weber indicates that the plant has turions (fleshy winter buds at base of stem), other floras indicate there are no turions. E. anagallidifolium is similar to E. hornemannii (shown below) differing by its smaller stature, nearly entire leaves, and shorter capsule. Jean Baptiste Lamarck named this species in 1786 from collections made in France. The specific epithet is from a Greek plant name which later was given to plants in the genus Anagallis (Pimpernel), Primulaceae (now often Myrsinaceae). Thus the specific epithet means, "with leaves similar to Anagallis". 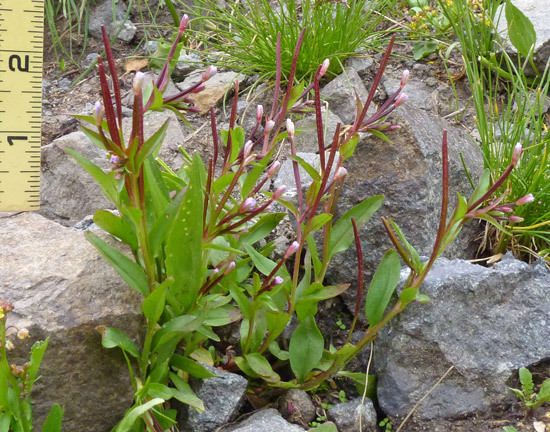 E. anagallidifolium is by several experts considered more appropriately named E. alpinum. Fen near Taylor Mesa Road, July 24, 2015. Buds often nod; flowers are erect. Flower color is pink to purple to rarely white. Flowers usually remain open for several days. Subalpine, alpine. Wet areas, tundra. Summer. Foothills, montane. Roadsides, meadows. Summer. Prater Ridge Trail, Mesa Verde National Park, August 13, 2005. 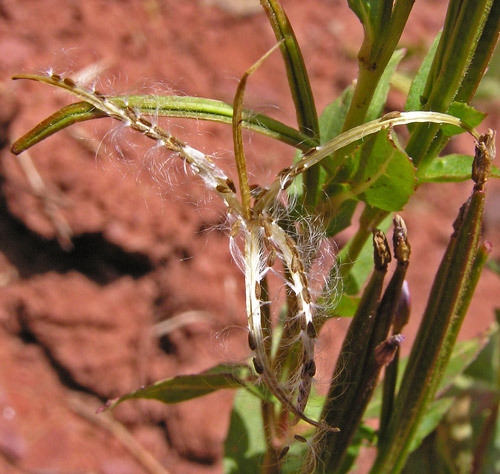 Epilobium ciliatum can grow in both moist and dry conditions, it can be 8 to 48 inches tall, and it is equally variable in leaf shape, amount of branching of the stem, and other characteristics. Even the silky fluff that carries the seeds can vary -- from white to dingy. 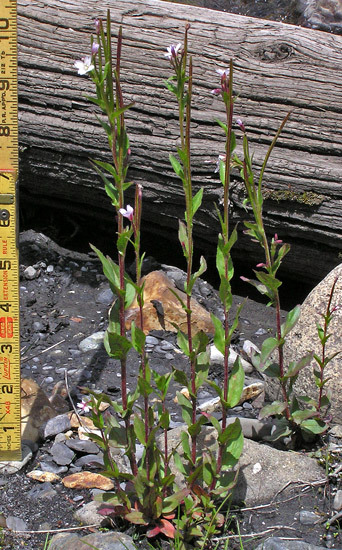 The picture at left shows just the lower few inches of a plant over two feet tall. Leaves are very minutely toothed and stems often reddish. Constantine Rafinesque named this species in 1808. The species has had several dozen other names since then. "Ciliatum" is Latin for "hairy" and botanically refers to fine, marginal hairs -- which can be seen as a silvery glow along the edges of some of the seed pods and buds in the two pictures below. 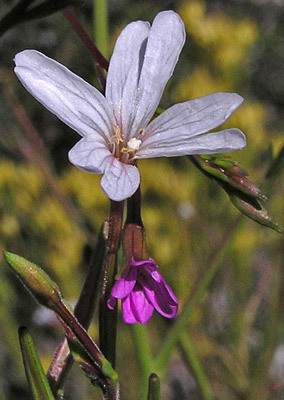 Pink flowers are most common for Epilobium ciliatum but white is almost as common and both pink and white flowers can appear on the same plant. Prater Ridge Trail, Mesa Verde National Park, August 13, 2005 and near Yellow Jacket Canyon, September 5, 2014. 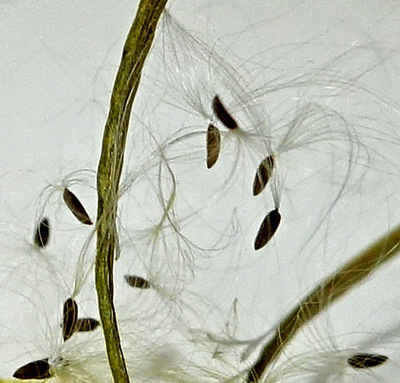 The long, vertical seed pods shown in the above left photograph will soon ripen and split in graceful arches exposing the soft tuft of hairs that are attached to and carry aloft the tiny (1+ mm) brown, minutely ridged seeds. The minute ridges (conspicuous only under high magnification) actually are long rows of dozens of papillae. 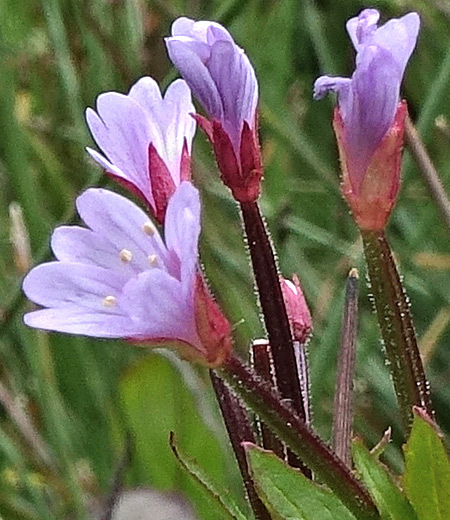 These ridges plus the great height of the plant, the presence of quite small serrations on the leaf margins, and the presence of *turions on one subspecies (E. glandulosum) are key characteristics separating this Epilobium from others. *Turions are minute, rosebud-like shoots on the roots or at the base of the stems of some aquatic or semi-aquatic plants. Montane, subalpine. 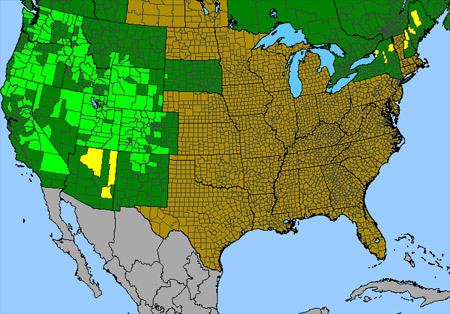 Meadows, streamsides. Summer. Kilpacker Trail, August 1, 2000. 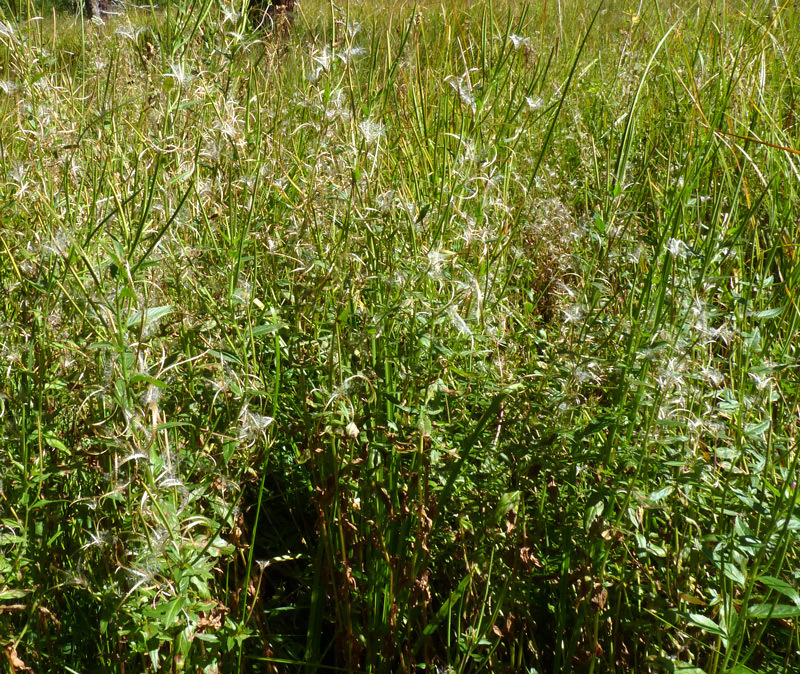 Epilobium hornemannii is a common and highly variable plant. Epilobium hornemannii flowers are tiny, pink/white/light-blue, and inconspicuous, but the plant is so common that it eventually attracts attention. 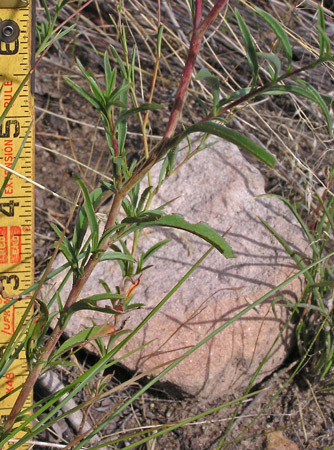 The pictured specimen is lush; other Epilobium hornemannii (see below) may have far fewer and narrower leaves, fewer stems, and be shorter. Exact identification is sometimes quite problematic since, as observed above, it also hybridizes . 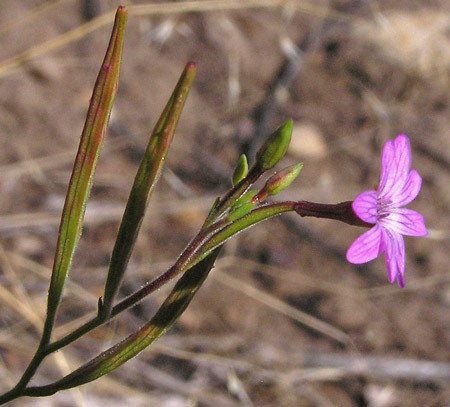 For instance, E. Hornemannii hybridizes readily with E. lactiflorum which occupies similar habitat as E. hornemannii and, according to William Weber, can be distinguished from E. hornemannii primarily by its "several broad withered leaves [at the base of the stem] at flowering time." E. hornemannii has "small and inconspicuous or no withered leaves" at flowering time. 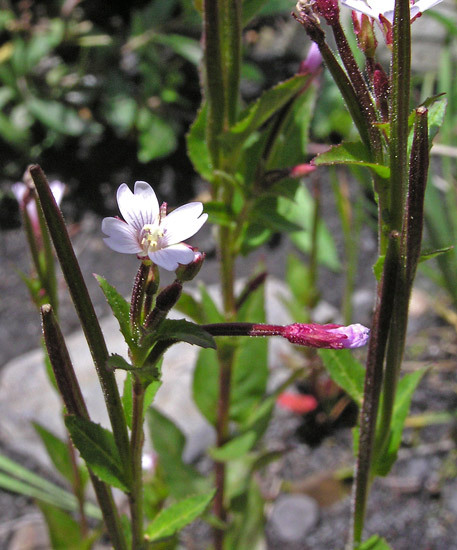 Look for Epilobium hornemannii along moist montane and sub-alpine trails, near ponds, and along irrigation ditches. 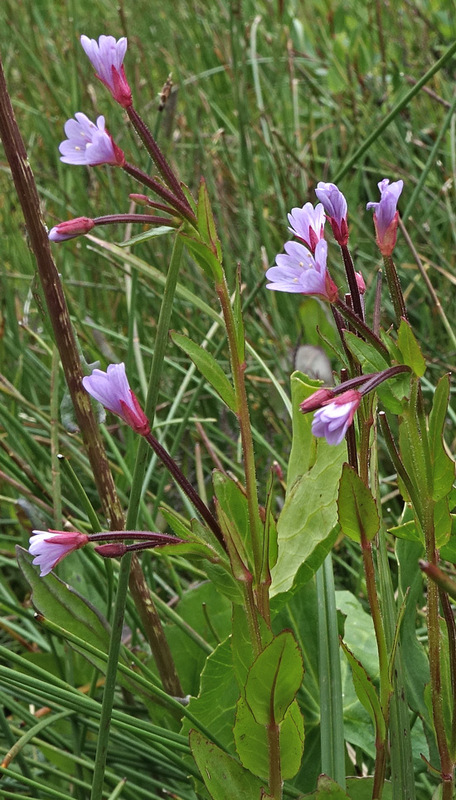 It is common for Epilobium hornemannii to have red stems and leaves in the spring and to return to these colors in the fall. Groundhog Meadow Trail, July 31, 2004. Colorado Trail near Kennebec Pass, August 12, 2004. 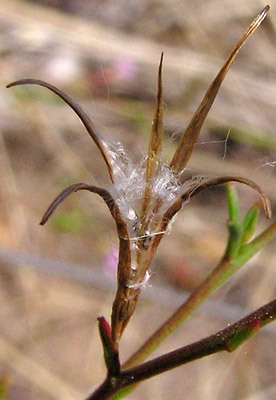 Epilobium hornemannii seed capsules (the dark vertical tubes in the lower and upper right) split in graceful arches (center) and the brown seeds imbedded in tiny white fluff are ready for a breeze. Ryman Creek Trail, August 30, 2013. Epilobium hornemannii puts on quite a show in wetlands where it can grow in thick clumps with numerous flowers that ripen and erupt with a fluff of seeds.